Last week I got in the mail the all new AirTV Player & Adapter by Sling TV. I’m really excited to test this device out over the next week or two and share my full review with you. In the meantime, I wanted to give you a look at what comes with the AirTV Player and Adapter and what the setup process looks like. This is a really innovative product for cord cutters because it brings together Sling TV streaming channels and free Over-The-Air local channels right in the same interface on the same TV input. If you want to read more about why I think this is going to be the most user-friendly cord cutting device yet, read my full article here. 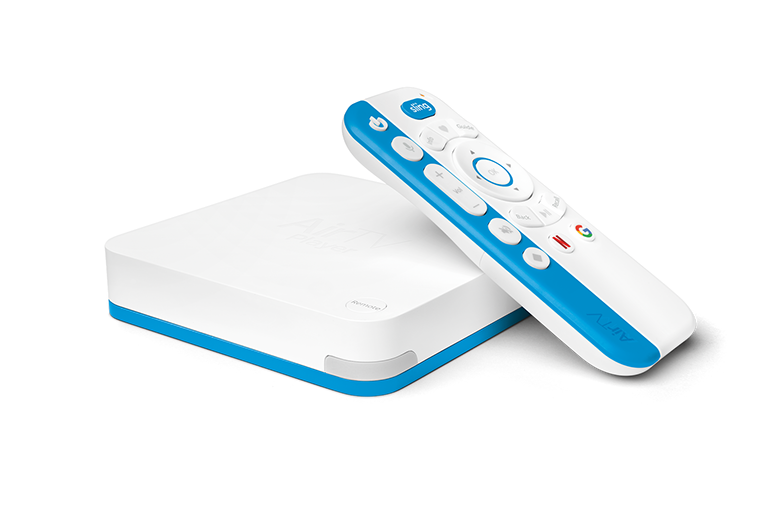 If you have any questions about the AirTV Player or Adapter or want me to try anything out during my testing, just leave a comment below. The 2017 Consumer Electronics Show wrapped up last week and one of my favorite new cord cutting products released during the show was the AirTV Player by Sling TV. This is the first time Sling TV has released their own branded streaming device, and I must say they did a phenomenal job. With AirTV they really focused on solving one of the most difficult hurdles with cord cutting, the separation between local Over-The-Air (OTA) channels and streaming channels. The main purpose of the device is to incorporate your local OTA channels, received through an antenna, into the Sling TV app without increasing your monthly Sling subscription. I really feel like they hit a big pain point with would-be cord cutters with the AirTV Player. That’s why I think it’s the most user-friendly cord cutting device yet! Here are some of the features that I think will make this the #1 recommended device for new cord cutters. When you get your AirTV there are only a few connections you have to make before you are up and running. Plug in the power cord, HDMI cable to an available port on your TV, the USB OTA tuner card, and finally your antenna to the USB OTA tuner card…that’s it! Once you power it on the app and channel setup process starts automatically. The remote can even program itself to your TV and sound system through the HDMI connection so you can start controlling your entire setup right out of the gate. After the initial setup, every time you turn the AirTV on it boots straight into the Sling TV app and the new app on AirTV now contains all your TV channels. You no longer have to change inputs on your TV and sound bar and fumble around with 3 different remotes to bounce between OTA and streaming. Even better, you don’t even have to switch between different apps. Using the Sling TV App on AirTV you can watch Sling streaming channels, OTA channels, and even Netflix shows all in the same beautiful user interface. 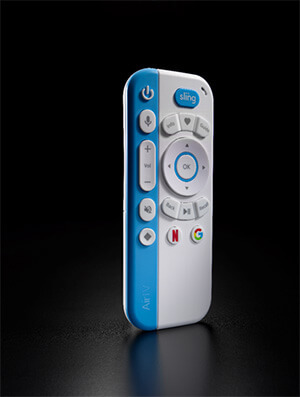 The remote that comes with the AirTV also has the ability to control your TV and sound bar. The remote has Voice Search and Voice commands so you can find content and control your AirTV just by talking to it. There are dedicated Sling and Netflix buttons right on the remote that allow you to access these apps in one click without having to scroll through long confusing menus. The AirTV Player by Sling TV runs the Android TV operating system. The big advantage with running Android TV is that you have a large preexisting library of apps that have already been developed for players such as this. Another great feature is that with Android TV you can install virtually any Android app available in the Google Play Store. The AirTV Player also supports 4K Ultra HD video so you are getting the latest and greatest technology built into this device. 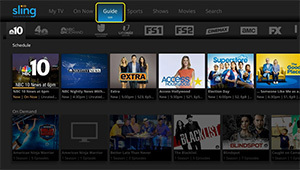 The AirTV Player also includes a handy over the air programming guide that will show you upcoming programs with show data. If you’ve been hesitant to pull the trigger on cutting the cord in your house because of the complexity of multiple devices, an abundance of apps, or the pains of switching between OTA channels and streaming channels, then your wait is over. I really think that the AirTV Player from Sling TV is the answer you’ve been waiting for. With this device, you get the traditional TV watching experience with the freedom and savings of cord cutting. To top it all off, Sling TV is running a special introductory offer. Right now, when you buy an AirTV, Sling will give you a $50 credit to use toward your Sling TV subscription! You can get the AirTV Player with OTA AirTV Adapter for $129.99 at www.airtv.net/store. When we cut our cable in 2014, we weren’t sure exactly where to start. We had heard some things about it and did a little research, but we were nervous. Would it work? Could we figure it out? What if we really miss all those channels that are included in our cable bundle? It came to the point where there were no more excuses. We had to bite the bullet, jump right in, and try it. We could figure things out as we go and we really had nothing to loose. In reality, we had only everything to gain with all the money we would be able to save and put towards student loan debt. Our monthly bill to the cable company had climbed to an astronomical $165. If we could reduce that and still enjoy our favorite TV shows we would be happy campers. We could concur our ultimate goal to reduce our monthly spending to help pay off debt and ultimately build wealth. We could do it and still enjoy some relaxing couch time in the evenings. Below are the steps that we took to become a cableless household. We started simple and added things as we felt we needed them. Looking back it was much easier to make the switch then either of us thought. The devices and apps were actually very user-friendly and with a little patience we figured them out in no time. Live TV was great and let us watch a ton of stuff, but we needed something to complement the live local channels. YouTube had a lot of great free stuff to watch and we already had a Netflix subscription so we were familiar with the things we could watch in the app, but we still were missing a few things. If we couldn’t watch a new episode of a show when it aired live, we didn’t have a way to view it on-demand. This had been where our DVR would have come in handy in the past, but it went out the door with our overpriced cable. Luckily for cord cutters, there are plenty of alternatives to a traditional DVR. After some research, we settled on the service PlayOn. We bought the Lifetime license and installed their companion apps on our laptop and the Fire TV and Roku. Now we could stream shows from the NBC, CBS, ABC, and Fox websites directly on our TV’s after they become available for free viewing. This worked surprisingly well, was pretty easy to setup, and we still use it to this day. After a year of using our cord cutting setup, it was 2015 and more cableless services had made their way to the market. The one that caught our eye was Sling TV. This was a service that Dish Network came out with to provide cord cutters the ability to stream premium TV channels at an affordable price. This was pretty ground breaking because in the past most of these channels were only available with a cable subscription. For as little as $20 each month, Sling TV would let us watch channels like ESPN, HGTV and CNN using their apps on our Fire TV and Roku. Best of all…NO CONTRACT! We were able to sign up and cancel whenever we wanted. For us, this was a great solution that rounds out our cord cutting setup. The last monthly cable bill we paid in 2014 was $165! After the upfront costs of getting things setup, we now spend only $55 each month. We pay $25 for Internet service, $20 for Sling TV and $10 for Netflix. That’s $110 back in our pockets every month! This is the cord cutting setup that we put together to fit our needs. It has been working out great and we love the financial freedom it has provided us over the past few years. With such a great experience, we can’t ever imagine switching back to cable. Updated 3/17/2016 – Apparently the NCAA March Madness smartphone app doesn’t support Sling TV logins. So in order to watch games on TBS, TNT and TruTV while you are out and about you will have to use the Sling TV app for iPhone or Android. Ahhhh…March. You have finally arrived. With your longer days, warmer temps and, most importantly, college basketball tournaments! That’s right everyone, March Madness is officially upon us. Here’s how you Cord Cutters out there can catch all the action from conference tournaments, such as the Big Ten, ACC, Big 12, Big East and SEC to the NCAA Basketball Tournament (A.K.A. the March Madness Tournament). Check out our guide below so you can tune into your favorite teams vying for a chance to go to the Big Dance. ESPN, ESPN2 and the Big Ten Network will carry the first three rounds of the tournament. ESPN and ESPN2 – Sign up for Sling TV’s $20/month package and download the app to your favorite streaming media player (like Roku or Amazon Fire TV). CBS will carry the semifinal and final games. CBS – Use an HD Antenna to pull in your local CBS station for free. ESPN and ESPN2 will carry all of the tournament games. ESPN2 and ESPNU will carry the first two rounds of the tournament. ESPN2 and ESPNU – Sign up for Sling TV and add the Sports Extra package. Then, download the app to your favorite streaming media player (like Roku or Amazon Fire TV). ESPN and ESPN2 will carry the semifinal and final games. ESPN and ESPN2 – The same Sling TV subscription as above, but you can go ahead and cancel the Sports Extra package. FS1 will carry all of the tournament games, except for the final game. FOX will carry the final game. FOX – Use an HD Antenna to pull in your local FOX station for free. The SEC Network will carry the first three rounds of the tournament. SEC Network – Sign up for Sling TV and add the Sports Extra package. Then, download the app to your favorite streaming media player (like Roku or Amazon Fire TV). ESPN will carry the semifinal and final games. ESPN – The same Sling TV subscription as above, but you can go ahead and cancel the Sports Extra package. NCAA.com and CBS will carry the NCAA Selection Sunday Show, where the NCAA basketball committee selects which teams have made the field for this year’s March Madness bracket. NCAA.com – In your computer’s internet browser, navigate to the basketball homepage on NCAA.com. Coverage of the entire NCAA March Madness Tournament will be spread out across CBS, TNT, TBS and TruTV. To figure out exactly what time and channel your favorite teams play on you will have to wait until the official bracket is set. Until then, have no fear. Here’s how you can catch any game on any channel throughout the tournament. TNT, TBS and TruTV – Sign up for Sling TV’s $20/month package and download the app to your favorite streaming media player (like Roku or Amazon Fire TV). TruTV is not normally part of the $20 base package, but since Sling TV loves their customers, they are giving all subscribers to the $20 package a free preview of TruTV during the tournament. From March 13th through April 12th you can catch all the games broadcast on TruTV without paying a dime more. Now that’s customer service!!! Not going to be at home – Download the NCAA March Madness app on your mobile phone and login with your Sling TV username to watch CBS games for free. Download the Sling TV app for iPhone or Android and login to your account to watch TNT, TBS and TruTV games. There you have it folks. That’s how you can watch all the March Madness action you can handle without cable.